When I offered to sub in for Donna on Friday, I assumed the episode would probably be less… divisive than last week's episode. And that’s what happens when you assume things: People get pregnant. More specifically, Robin gets pregnant. Well, it’s five years later. And right now, it’s very likely that Robin will be the one married at season’s end. The show has struggled with Robin since that breakup, never really knowing exactly what kind of mess to make her (a joke at work? a joke personally?). As such, she and Ted have largely lived in stasis. A lot of people reacted viscerally, almost violently, to last week’s episode, and I assume this will be the same sort of thing. I don’t think we have to belabor the point, but we can probably all agree this show has already outlived its premise by about three years (if not more): Everybody wants Ted to just meet his goddamn wife already. 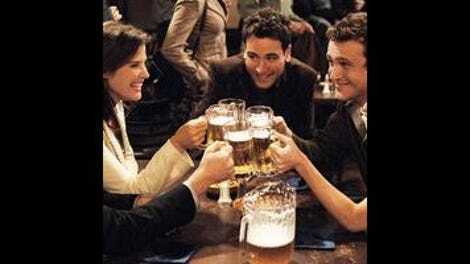 Out of necessity, as the show lumbered on past the point in life that a real life Robin would have traipsed off to Tokyo and Greece, while Ted’s stasis has become a problematic narrative issue, you could argue that Robin’s instead became its own narrative. In a lot of ways, Robin failed. And, as Barney told Robin last week, “What if it’s actually the story of how we got back together?” What if the leap this show is willing to make is a different kind of story? A somewhat melancholy—and let’s hope, bittersweet—one of how plans change, and how you can look someone in the eye and say, "I want my life to be an adventure," only to find yourself staring at a more normal existence. Am I giving the show's writers too much credit for this? Probably so. Could latter-day HIMYM pull that off? Probably not consistently, no, but even now, the show delivers those moments—Ted seeing Victoria off at the bus, Marshall at the funeral—that few other shows can do quite as well. I am, as a viewer, willing to let this thing one character never wanted happen, because.. life sometimes works like that. “It gets pretty tough,” as Barney says. Will the show offer dueling parenting narratives and become some kind of “Up All Night” mutant? That would be strange enough, I guess, but the show’s handled the stuff from writerly experience the best as of late (the father-related stories from last season). Or will the pregnancy end in some way? That would be a lot of realness, even for this show. In the meantime, the writers have managed to surround these late innings Barney and Robin revelations of the past few weeks with three consecutive funny episodes, and oh hey, this is a comedy. “The Rebound Girl,” it must be said, balanced a silly premise (bro-parenting) with some weightier matters of growing up and of feeling displaced, and golly gee, the show pulled off the bro-parenting besides, just because NPH and Josh Radnor had such an awesome time with it. Even if it had to do a few awkward appearances of characters (James randomly standing in the foyer, Marshall tapping at the window) to get there, I laughed a lot. And that’s what I take away from tonight, from this mess of a show: I’m already in it for the long haul with these characters (like cousins I feel obligated to see), so if latter-day HIMYM can make me laugh, and break off a moment of true clarity, then that’s enough for me. Okay, outside of these two stray observations, “Ted seems to being going through a rough patch constantly” and “What was that skirt Robin was wearing?” I really want to just talk about how funny this was. “Who are you gonna call?” A million points forever. Ghostbusters references make everything better. I just want a loop of Jason Segel walking into the apartment and trying to get the turkey through the doorway (“Okay, I changed my mind, I want an epidural.”). Josh Radnor’s delivery of, “Girlfriend, if all three of us were gay, we would be having fun” would also be good on a loop. Or, “There’s a chance, that adopting a baby, no matter how cute he is in my head with his little cowboy outfit on and he’s riding our dog like a horse and we also have a dog—pure-bred golden, but it’s okay, she’s a rescue”. Finally, the five options for your house (I like year-round haunted house best personally): 1. Sell it. 2. Year-round haunted house. 3. Giant fence around the perimeter, chimp sanctuary. There’s already a tire swing in the backyard. 4. We destroy it with sledgehammers. 5. Move in, raise our children, make this our family home. Until they graduate and we destroy it, with sledgehammers. As a family.